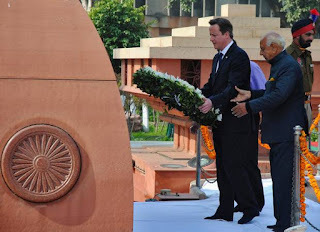 On February 20, 2013 Prime Minister David Cameron of Great Britain visited the site of the 1919 Amritsar Massacre, where the British Brigadier-General Reginald E.H. Dyer fired on peaceful protesters, officially killing about 400 and possible killing as many as a thousand. Cameron referred to the massacre as a “shameful event.” Since then many commentators in India and Britain have been discussing whether this was an apology and whether it should have been one. A good political apology has several characteristics: it acknowledges the facts of the event, expresses sorrow and remorse, takes responsibility for the harm done, and promises non-repetition. Cameron acknowledged the massacre and expressed sorrow by using the word “shameful.” He did not, however, take responsibility for the harm done, implying that the UK government of the time had done so, condemning the massacre in 1920 and dismissing Brigadier-General Dyer. Nor did he promise non-repetition, which is unnecessary, as Britain is no longer the colonial ruler of India. In a full political apology, though, Cameron would actually have used words such as “sorry” or “I apologize.” And the British government would have negotiated the words of the apology with the Indian government ahead of time. A good political apology also contains symbolic, ceremonial and ritual elements that show sincerity. Cameron’s words and actions did seem to be sincere. He was the first sitting British Prime Minister to ever visit the site of the massacre, a symbolic event in itself. As a mark of respect he adopted partial Sikh dress for the occasion, appearing in a turban and shawl. He laid a wreath on the memorial and he observed a minute of silence—both Western symbols of mourning. Some reports said he got down on his knees or “bent on his knees.” To kneel is a very powerful act in Western culture, as shown when Chancellor Willy Brandt of Germany went down on his knees at the Warsaw Ghetto—where Polish Jews had been held by the Nazis before being transported to extermination camps—in 1970. 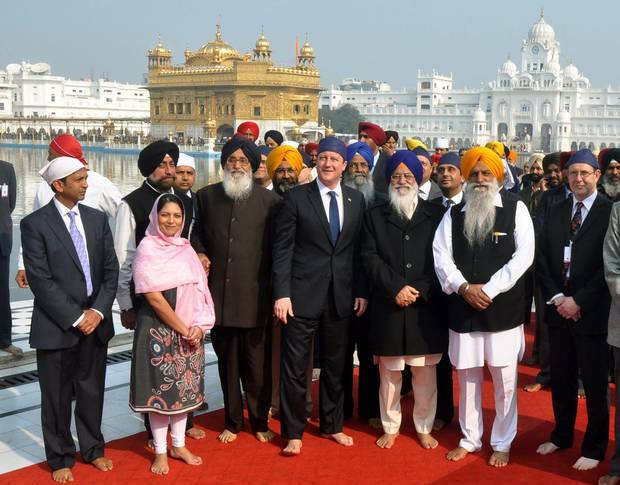 No doubt Cameron chose his words carefully before he arrived at Amritsar. Someone must have found the 1920 quote from then Secretary of State for War Winston Churchill describing the massacre as monstrous (it’s surprising that Churchill said this, as he was an unrepentant colonialist, as shown by his indifference to the 1943 famine in Bengal). And because there are still living descendants of the victims at Amritsar, Cameron and his government might have been afraid that they would ask for compensation if he actually offered an apology. Recently, a group representing the Kenyan “Mau Mau” nationalist victims of the British in the 1950s were granted the right to pursue their claims for reparations in British courts. This might be why Cameron said he saw no point in reaching back in time to apologize for distant events that had occurred, in the case of Amritsar, long before he was born. His message was probably carefully calibrated to avoid legal liability. Some newspaper reports suggested that the real reason Cameron expressed sorrow was to help the Conservative Party gain votes from the 800,000-strong British Sikh community. The Sikh vote is particularly important in marginal ridings in London and Leicester. If this was one of his motives, it is similar to an “apology” that Canadian Prime Minister Stephen Harper, also a Conservative, delivered to a group of Indo-Canadians in 2008. On May 23, 1914, 376 Sikh would-be immigrants arrived in Vancouver on the ship the Komagata Maru. The Canadian authorities refused to allow the passengers to land and they were returned to India, where 38 people were killed and many more were imprisoned or transported. Many commentators thought that Harper offered this apology because he was wooing the Indo-Canadian vote. In any event, his remarks seemed rather off-hand. Some felt that he should have apologized from the floor of the House of Parliament, as former Prime Minister Brian Mulroney did in 1988 when apologizing for the internment of Japanese Canadians during WWII, and as Harper himself did in 2008 when apologizing to aboriginal Canadians. Cameron’s words in the visitor’s book were more than the Queen said when she visited Amritsar, merely calling the massacre a “distressing” episode, according to an article in the Indian Express commenting on Cameron’s visit. Like Cameron, the Queen must choose her words very carefully. When she visited South Africa, another former colony, in 1999, she said “we should remember with sadness the loss of life and suffering” of both blacks and whites during the Boer War. This might be seen as a form of acknowledgement or even regret, but it was certainly not an apology for the British war against the Dutch-origin Boers; moreover, the Queen did not go so far as to apologize for British conquest and maltreatment of Black South Africans. So Cameron’s remarks and gestures weren’t quite an apology. They are probably as close as India and Sikhs worldwide will get to an apology, though.